Every few months I navigate to the Franck Muller website and spend time marveling over their collection of awe-inspiring timepieces. I’ve always aspired to purchase one of these marvels of engineering but, sadly, my pay grade is far below the requirement. I decided to look elsewhere. Watch companies—especially those based in China—are not above borrowing components of a competitor’s successful design and making it their own. 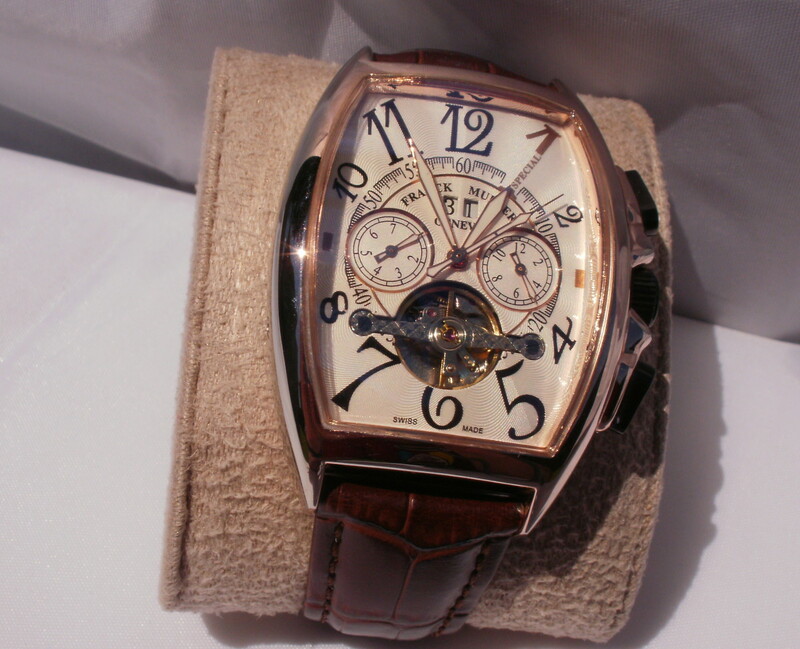 With this in mind, I checked out a number of websites, seeking a watch similar to the Franck Muller Casablanca. 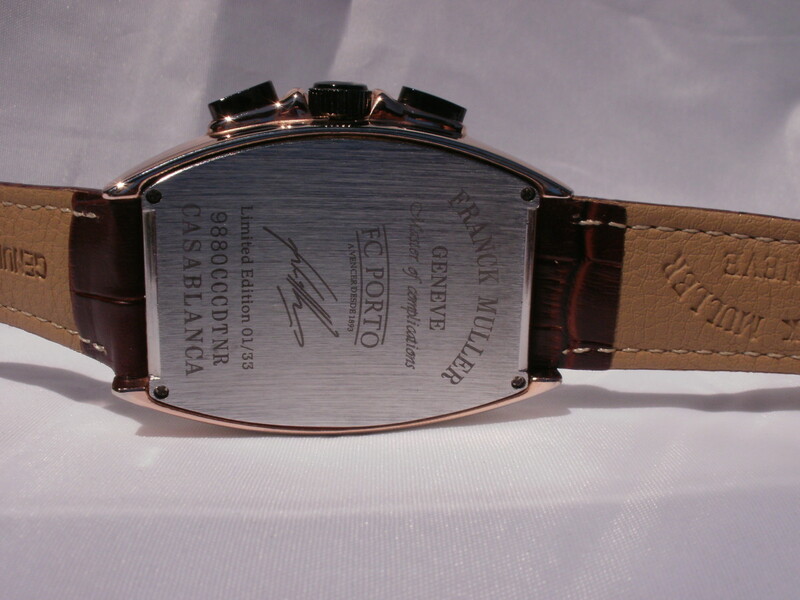 At DHgate I found a no-name brand that copied the barrel shape favored by Franck Muller. This watch happened to be on sale, bringing it into my price range. I submitted an order. The timepiece arrived on schedule, packed snugly inside a Styrofoam watch box. Eagerly I pulled off the lid and withdrew my new purchase. This no-name watch was branded, after all. Across the face was printed FRANCK MULLER. A replica! I winced and dropped it back into the box. 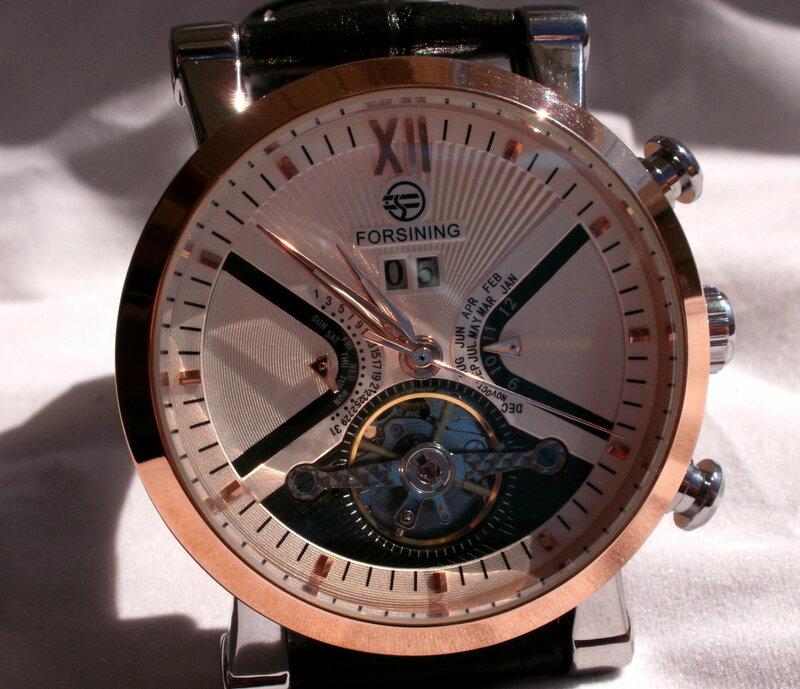 Often a manufacturer will produce watches that are very similar to those offered by an established watchmaker. 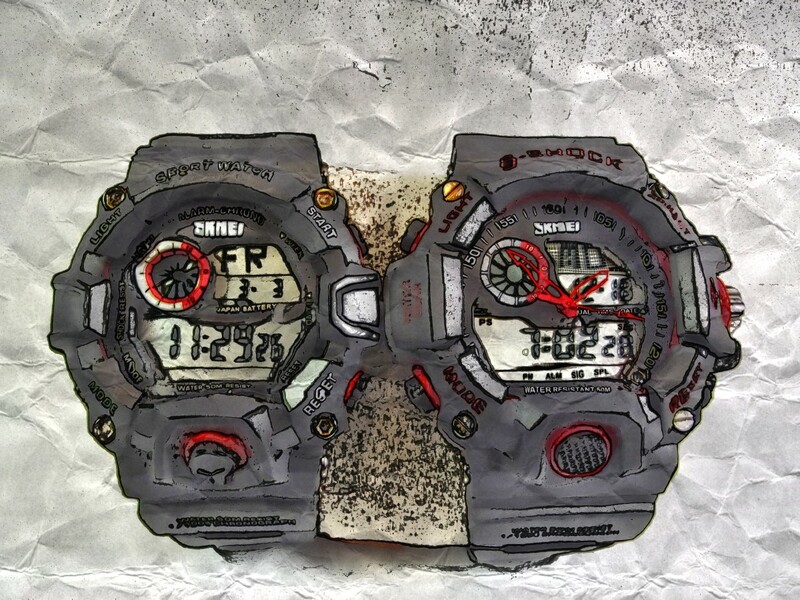 When it comes to replicas, however, the competitor not only swipes the design; they steal the very name and reputation of the original developer. 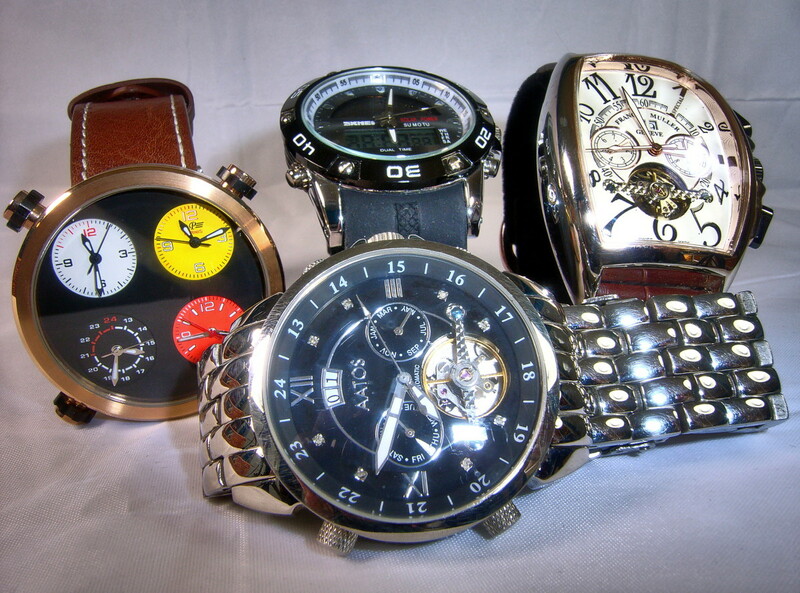 High end Swiss watches are popular partially because of their exclusivity. If the market were to be flooded with cheap knockoffs, the original company’s customer base might well begin to dwindle. Hard working craftsmen could lose their jobs. It gets worse. One-hundred-dollar replicas are poorly built compared to the models they copy. As these fakes began to fail, the original watchmaker’s reputation will suffer. They have nothing to do with the construction of these timepieces, but their name is printed on the dial. When reputations sour, companies falter and fall. Jobs are lost forever. I decided to compose a review of this watch. While I am normally sympathetic toward watch companies, those that produce replicas are not so compassionately treated. If you are looking for an inexpensive luxury watch but will not consider a replica, I suggest you check out my review of the M Johansson G-MhsenoRgRgRgB. 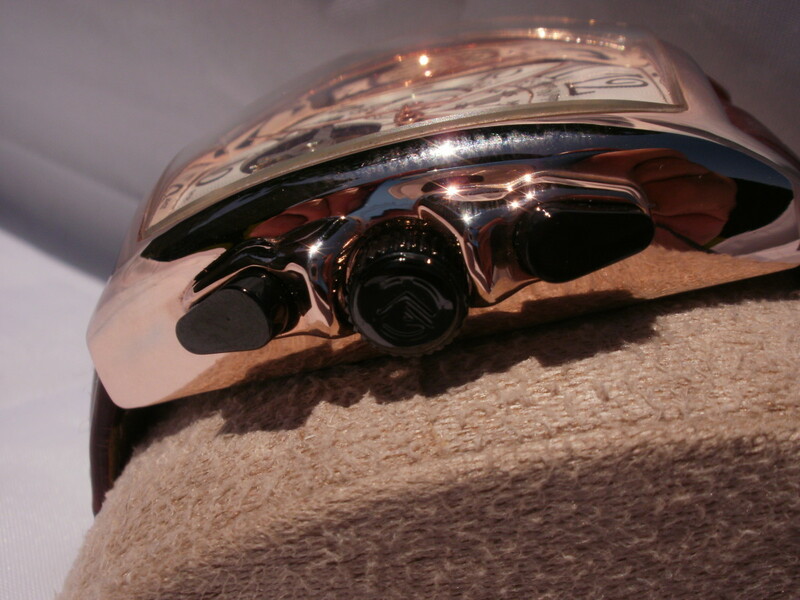 This Tonneau shaped watch is 17mm thick. It measures 55mm from top to bottom and 43.4mm across. The timepiece weighs in a 101 grams (3.56 ounces). The dial—thanks mainly to Franck Muller’s original design work—is beautiful. Black numbers of varying size line the edge of a nicely patterned white dial. Two windows positioned near the top of the dial display the day of the month. Sunken, gold rimmed subdials indicate the day of week and month. Two plastic pushbuttons located on the right edge of this watch allow adjustment of day of month and month of year. A sunken pushbutton on the left edge is used to adjust the day of week. The bottom plate of this timepiece is secured by four screws. Beneath this plate is an unbranded automatic movement. The rotor of this movement emits an unusually loud—almost irritating—rattle when the watch is shaken. This does not effect its operation. The strap is 22mm wide, reasonably thick and composed of PU leather. 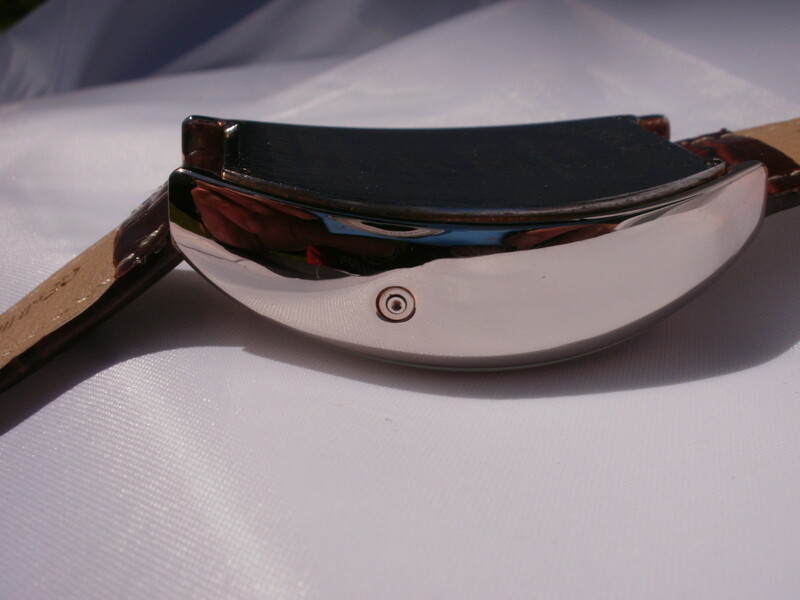 The buckle is larger than normal and designed to match the watch case. PU leather is produced by covering a backing fabric such as polyester, cotton or shredded leather with a layer of polyurethane. Pu leather tends to crack around stress points after continuous use. 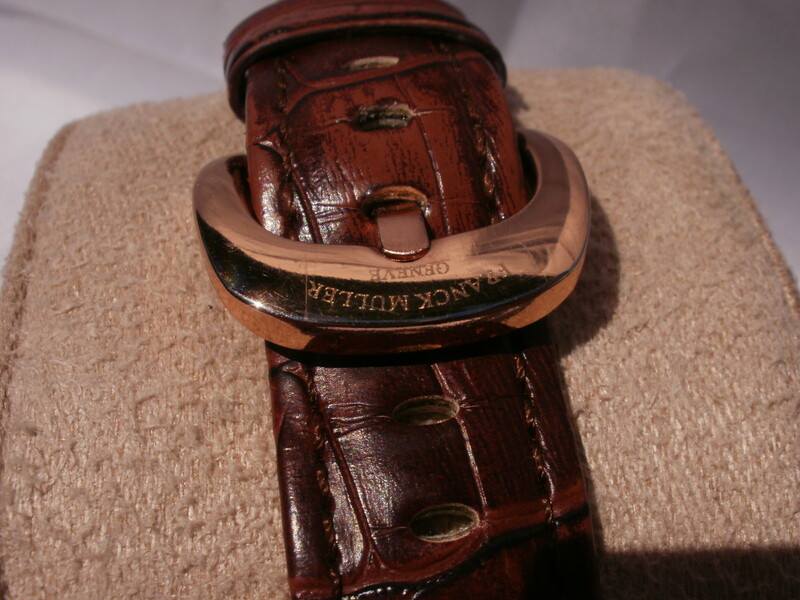 In this particular strap the color patterns, representing grain, appear faded and washed out. After six weeks of continuous use, however, the band has proved remarkably sturdy. 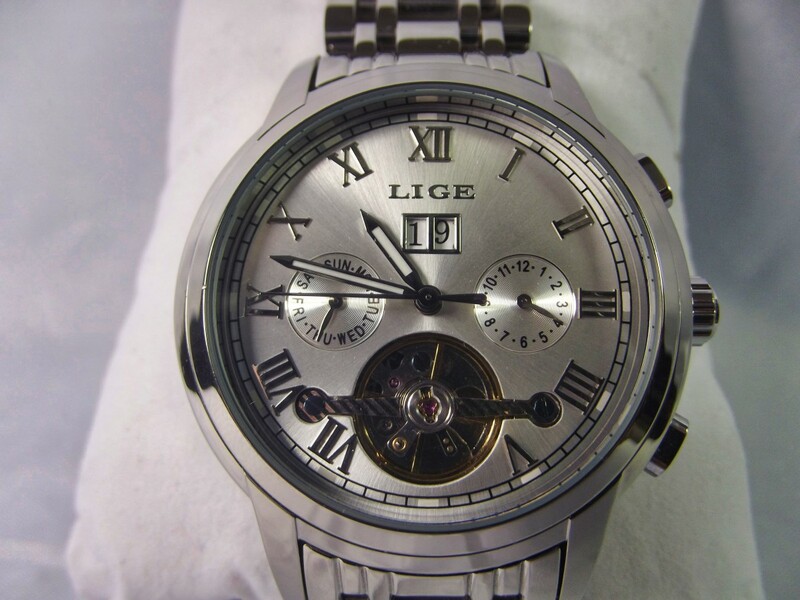 This timepiece is sold via DHgate. Branding information was deleted from the vendor’s images. The name of the manufacturer is unknown but the company is based in China. The huge, and well curved silhouette of this watch reminds me of the hull of a submarine; I suppose that’s my naval background rising to the surface. Large numbers circle the edge of the dial, squeezed in typical Franck Muller fashion along the left and right side of the watch. Sunken subdials add to the charm. I normally admire the open heart design. This watch, however, would attract a more sophisticated clientele if this treatment were omitted. On each end of the case, between the lugs, there is a series of short, scratch-like marks. These are positioned where the end of the leather strap butts against the case. I expect these mars were made during the manufacturing process. While this imperfection is only noticeable upon close inspection, the case of a hundred-dollar watch should be blemish free. The PU leather band does not appear as realistic as I would expect but I do appreciate the gold colored buckle which complements the watch’s case. I tested this watch for a week. During this period the day of month function and both subdials worked perfectly. Over seven days this replica gained an average of four seconds per day. This result brought a broad smile to my face. A word of warning. 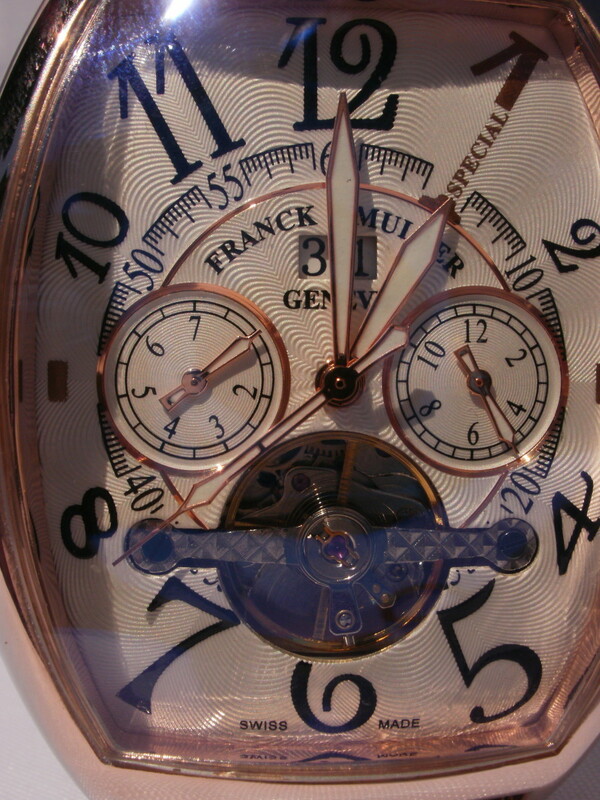 Hundred dollar watches are not routinely adjusted for super-watch accuracy before leaving the factory. I won the lottery in this instance. Still… give the Devil his due; this timepiece is the most accurate automatic I have ever owned. 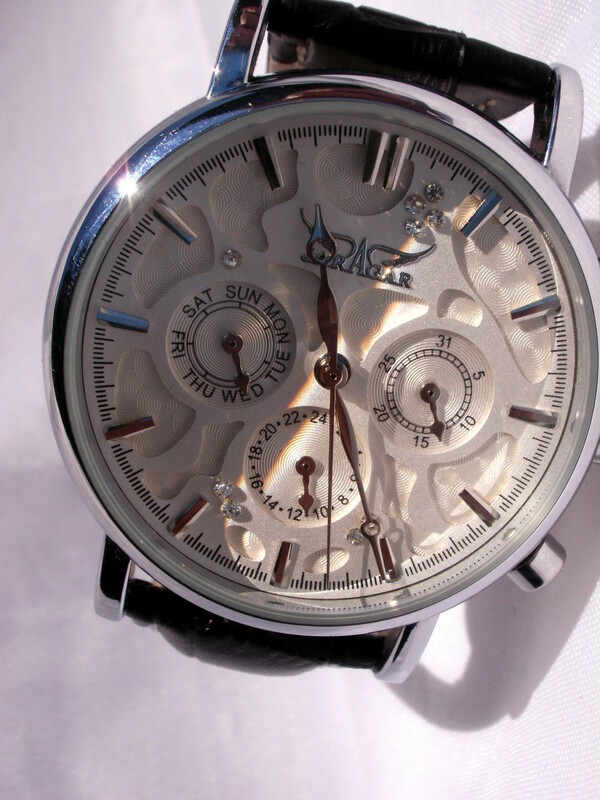 One day, while entering my house, I accidentally banged this watch sharply against a door jam. A shard of glass, so small the blemish is almost imperceptible, was scraped from the surface of the crystal. Other than that watch survived undamaged. 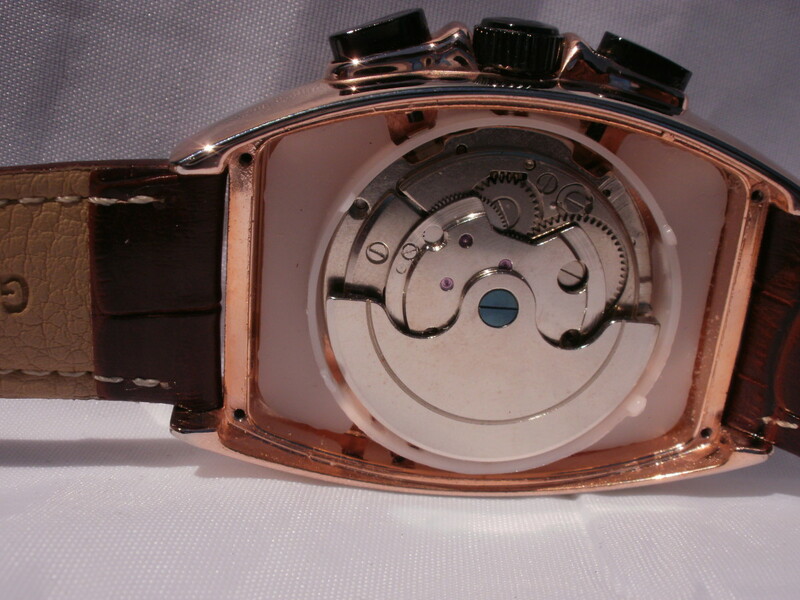 Plastic pushbuttons are utilized to adjust two of this timepiece’s functions. I question the use of plastic buttons on any watch sold for more than fifteen dollars. The lower button sits loosely in its socket. Its action reminds me of when I was a child; probing a tooth that wiggled distressingly, signalling impending lose. While the button remains seated, I realize it eventually will drop from the case, causing all sorts of grief. The watchstrap is composed of PU leather. While it is of decent quality, life span is limited. You would expect a real leather strap to be supplied with a watch in this price range. 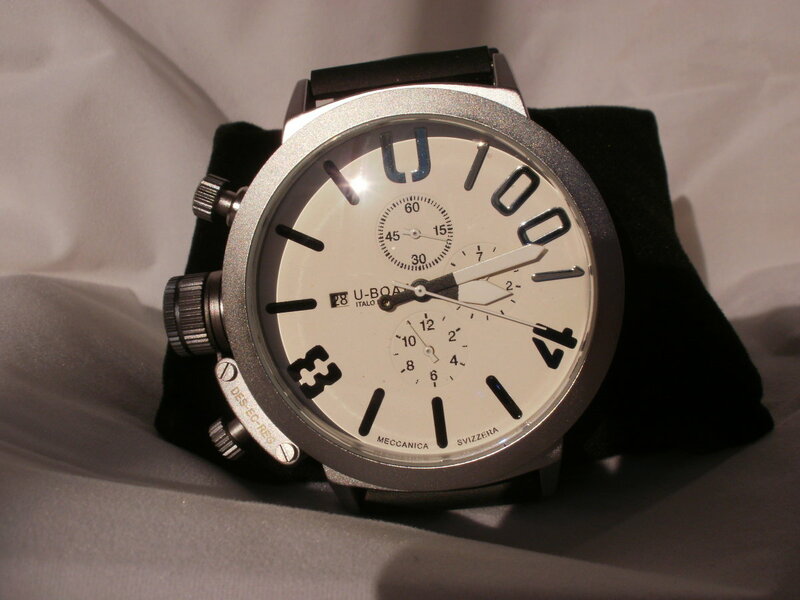 This replica is an attractive and reasonably lightweight calendar watch. I am impressed with the movement which, after six months of use, has proven highly accurate. Sadly, quality control is poor. 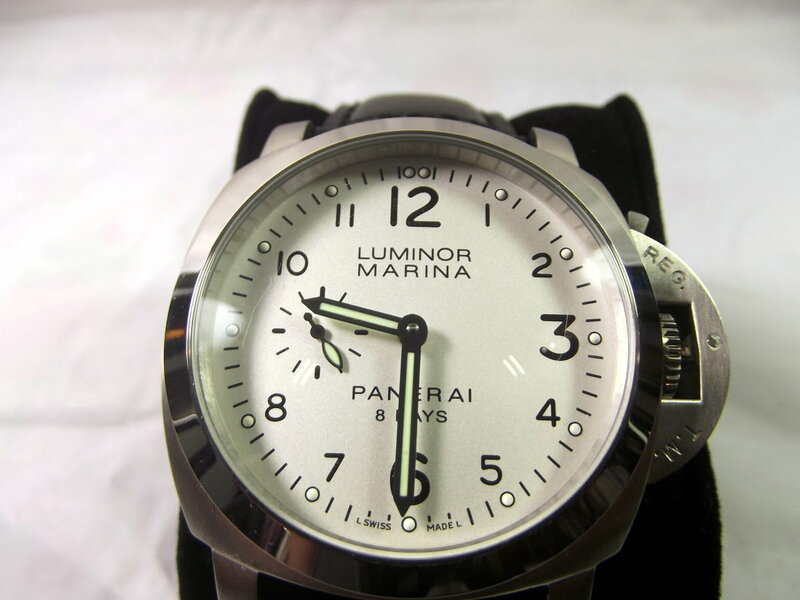 The lifespan of this timepiece will be limited to the length of time its faulty plastic pushbutton remains in place. You can do better for a hundred dollars. I have to admit, despite the lack of quality control, this watch--admittedly seldom used--still keeps accurate time when I slip it on my wrist. It is gaudy but the value is there. I agree with you. Some of these fakes can turn a head but when it comes down to it; it's a piece of junk waiting to happen. There are however, fakes that are so close that it takes an expert to identify it. These cost several grand. I have read that out of work watch makers have partnered with (some highly questionable individuals) some that specialize in mimicking the real deal. I have seen one before. The weight and quality is there. I guess cars will be next. You are absolutely correct, dvtrupp. The Franck Muller Casablanca is a sophisticated timepiece intended for wealthy customers who understand the delicate and difficult to produce touches that made this luxury watch famous. The replica in this article is aimed at those who want a taste of luxury without paying a great deal for the product. This is more of a 'fun watch' than an attempt to exactly copy the original. I'm not sure of what you refer to when you write 'function pushers' but Franck Muller replica's are available without the exposed function wheel feature. I consider myself an expert on watches. FM would never ascribe to the use of function pushers and the exposed balance wheel is designed to appeal to the untrained eye who can not distinguish it from a turbillon complication. Yes. I have always had decent service from the vendors at DHgate although their command of the English language is not always so good. If there is an option to pick a certain color or model, be sure to select that. If this option is not easily found, send a message to the vendor, after the purchase, specifying the color you desire. Be aware that it can sometimes take as long as five weeks for items to make their way to you from China. When ordering watches through DHGATE do you find that you get the product as advertised on the site? What I mean is, is it at least the same model and color that you think you are buying? The vendor I bought this from no longer has that exact model in stock. 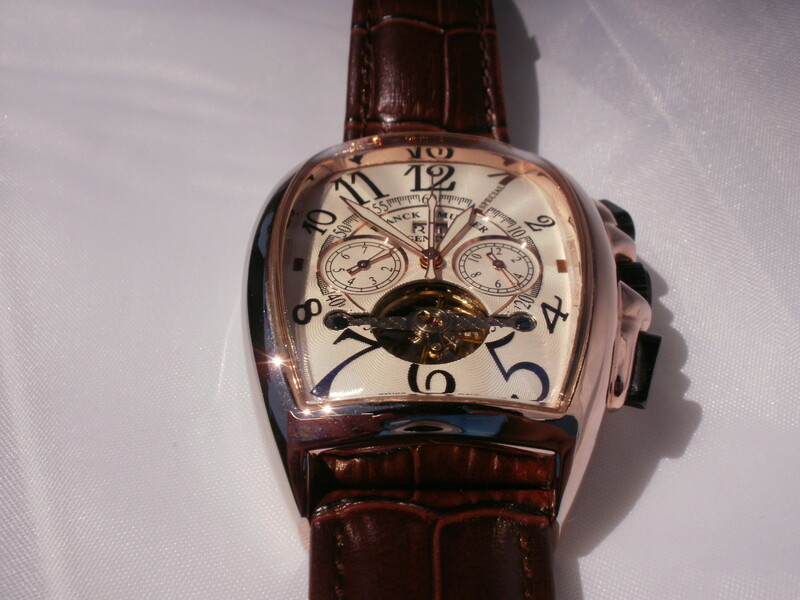 If you go to DHgate and search for "conquistador" you will find about thirty watches similar to the Franck Muller Conquistador. Hopefully this is helpful. Do you have a link to this watch at DHGATE?